BACKGROUND AND PURPOSE: As is the case for CT scans, MR images may occasionally appear deceptively normal unless proper windowing is used. We sought to illustrate the necessity for proper windowing and for assessing the gray–white matter differentiation on diffusion-weighted (DW) images in the setting of hypoxic-ischemic encephalopathy. METHODS: Six comatose patients (age range, 34–56 years) underwent MR imaging in the early phase (range, 1–5 days) after severe anoxic insult. T2-weighted, turbo fluid-attenuated inversion-recovery, and DW images were obtained in all six patients, with contrast-enhanced T1-weighted images obtained in four and apparent diffusion coefficient (ADC) maps in five of the six patients. RESULTS: At presentation, each of the six patients had symmetric, uniform hyperintensity in the cortex (mean ADC, 0.35 × 10−3 mm2/s) relative to the white matter (mean ADC, 0.91 × 10−3 mm2/s) on DW images. Each also had a poor outcome: brain death in four patients and a permanent vegetative state in two patients. CONCLUSION: The appearance of the MR images in the setting of diffuse cortical laminar necrosis can be deceptive to the unwary radiologist. The key to correct interpretation is proper windowing and the marked gray–white matter differentiation on spin-echo images but best seen on properly windowed DW images in the early subacute phase. This appearance also implies an extremely poor outcome, either a permanent vegetative state or brain death. Hypoxic-ischemic encephalopathy (HIE) results from a global insult, either due to ischemia from hypoperfusion or hypoxia in the setting of sufficient perfusion (1). Although there are a multitude of causes of HIE, the most common in the adult are cardiac arrest and respiratory failure. Neuroimaging can serve an important role early in the postanoxic state, since MR imaging with diffusion-weighted (DW) imaging is considered an accurate predictor of the extent of infarction (2) and has shown utility in revealing acute or early subacute findings associated with global cerebral anoxia (3). In the setting of nontraumatic coma due to HIE, generally the outcome is poor with only a minority of patients recovering independent function, particularly if there are ominous signs on neurologic examination (4). In the six patients described herein (all of whom were in a coma at presentation), clinical concern existed as to the extent of brain injury, and the prognostic implications of the neuroimaging were of importance to the neurologists and intensivists to discuss with the patients’ families the potential withdrawing of medical treatment. We evaluated a potentially deceptive imaging appearance of diffuse cortical laminar necrosis on DW images. Six patients (four male, two female; age range, 34–56 years) were comatose at presentation and underwent MR imaging, including DW imaging. All patients had experienced anoxic events (cardiopulmonary arrest in four, attempted suicide by hanging in one, and hypoperfusion–hypovolemia from gastrointestinal hemorrhage in one) and had undergone MR imaging to aid in determining the neurologic prognosis (Table 1). All patients were unresponsive and considered comatose by the neurologists at the time of the MR imaging study. In five of the six patients, MR imaging was performed within 3 days of the anoxic episode, and in one patient the examination was performed 5 days after the anoxic event (range, 24 hours to 5 days after anoxic episode). None of these individuals was examined with MR imaging in the first 24 hours. Follow-up or repeat MR imaging examinations were not performed in any patient. Four of the six studies were conducted by using a 1.5-T system (Siemens, Erlangen, Germany) with echo-planar capability. These studies included the following sequences: axial fast spin-echo T2-weighted (3300–3500/90/2 [TR/TE/NEX] with 5-mm section thickness and echo train length of 7), axial turbo fluid-attenuated inversion-recovery (FLAIR) (9000/110/2000/1 [TR/TE/TI/NEX], 5-mm section thickness), and axial DW (4000/100 [TR/TE], 5-mm section thickness, and b = 1000 s/mm2). The fifth patient was examined with a 1.5-T system (Philips, Best, the Netherlands) with echo-planar capability, with the following sequences: axial fast spin-echo T2-weighted (4213/70/3, 5-mm section thickness, echo train length of 15), turboFLAIR (6500/105/2100/2, 5-mm section thickness), and axial DW (4524/95, 5-mm section thickness, b = 1000 s/mm2). MR imaging in the sixth patient was performed with a 3T system (Philips) with echo-planar capability, with the following sequences: axial turbo spin-echo T2-weighted (3000/80/1, 5-mm section thickness, echo train length of 15), turboFLAIR (11,000/120/2800/1, 4-mm section thickness), and axial DW (2904/72, 5-mm section thickness, b = 1000 s/mm2). Axial DW images on all three MR units were obtained at a slightly more oblique orientation than the spin-echo images to minimize susceptibility artifact caused by air in the sphenoid sinus. Axial DW images were reviewed at a consistent window/level of 250/150. T2-weighted images were reviewed at 700/500, and turboFLAIR images were reviewed at 650/400. Apparent diffusion coefficient (ADC) mapping and values were obtained in five of the six cases (measured in the precentral cortex, centrum semiovale, and caudate nuclei). Coronal T1-weighted images were also obtained in four of the six cases after intravenous administration of a gadolinium-based contrast agent (Gadopentetate dimeglumine; Magnerist, Schering, AG, Germany). Three neuroradiologists jointly reviewed each case retrospectively without blinding, although none disagreed with the initial neuroradiologist’s interpretation. In four patients, CT was performed initially (before MR imaging), and the scans were interpreted as normal in three (patients 1, 5, and 6). The CT scan in the other patient was interpreted as having only a small amount of traumatic subarachnoid hemorrhage, with normal gray–white matter differentiation of the cerebral hemispheres (patient 3). In each of the six MR imaging studies, only mild abnormality was considered present on the T2-weighted and turboFLAIR images, with mild accentuation of the gray–white matter differentiation of the cerebral hemispheres and variable degrees of gyral swelling. In each of the six studies, however, the diffuse cortical abnormalities were more apparent on properly windowed images, particularly on DW images. Patient 1 had experienced an anoxic episode during surgery and underwent cardiopulmonary resuscitation. This patient’s initial cranial CT (Fig 1A) was interpreted as normal 4–5 hours after surgery. 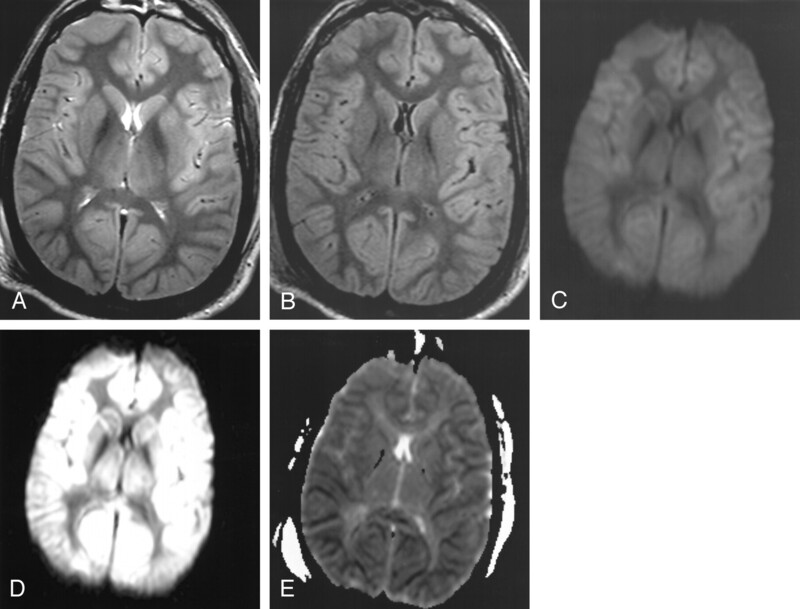 At MR imaging (obtained at 3 days after surgery), the T2-weighted and turboFLAIR images (Figs 1B and 1C, respectively) demonstrated mildly pronounced gray–white matter differentiation and mild diffuse swelling of the gyri. Initially, the DW images were improperly windowed at 1000/400 (Fig 1D) by the technologist and sent to the neuroradiologist for review; these images appeared deceptively symmetric without focal hyperintense abnormality. However, the images were windowed again at a window/level of 250/150 (Fig 1E); these properly windowed DW images demonstrated diffusely abnormal hyperintense cortical signal that was shown to be restricted on the ADC map (Fig 1F). Further review of Fig 1D illustrates that, although improperly windowed, the gray–white matter differentiation in this patient is pronounced and gyral swelling is present. Similar findings were present in patients 2–6. Patient 1. A 54-year-old comatose man experienced an episode of apnea and hypoxia during surgery, with subsequent cardiopulmonary arrest and resuscitation. A, CT scan obtained 4–5 hours after surgery does not show any significant abnormalities and was interpreted as normal. B, T2-weighted MR image (windowed at 700/500) obtained 48–72 hours after the hypoxic-ischemic episode illustrates mildly pronounced gray–white matter differentiation of the cerebral hemispheres and gyral swelling. C, TurboFLAIR image (windowed at 650/400) demonstrates similar findings as those on the T2-weighted image, with mildly pronounced gray–white matter differentiation. D, DW image with initial window/level (improper window/level of 1000/400) that is not in keeping with our usual window/level (250/150) shows that the diffuse cortical abnormality is obscured. Although improperly windowed, there is pronounced gray–white matter differentiation, not usually present on DW images (see Fig 2). E, The abnormality is more distinct on this properly windowed DW image (windowed at 250/150), which shows diffuse uniform cortical and caudate hyperintensity with accentuation of the gray–white matter interface. F, ADC map demonstrates severe, uniform, cortical restricted diffusion (mean ADC value, 0.31 × 10−3 mm2/s as measured in the perirolandic cortex in this patient) that was interpreted as cortical laminar necrosis. Electroencephalogram obtained the next day (3 days after cardiorespiratory arrest) was interpreted as electrocerebral silence, and support was withdrawn per request of the patient’s family. Figure 2 illustrates the findings of a properly windowed DW image in another patient (patient 5) with diffuse cortical laminar necrosis (Fig 2A) versus an improperly windowed DW image in the same patient (Fig 2B with window/level of 850/400); these two images are compared with the appearance of a properly windowed DW image in a neurologically normal 40-year-old man (Fig 2C, window/level of 250/150). Figure 2C demonstrates that there is usually only minimal gray–white matter differentiation on DW images in a neurologically normal patient. Patient 5. Improper versus properly windowed DW images in a patient with HIE versus a properly windowed DW image in a neurologically normal 41-year-old man; all images were obtained with the same MR system. The 41-year-old patient underwent MR imaging approximately 48 hours after a global hypoperfusion-hypoxic event secondary to attempted suicide by hanging. CT scan (not shown) obtained 2 hours after the injury was interpreted as normal. A and B, Properly windowed (250/150) DW image (A) versus an improperly windowed (850/400) DW image (B) in patient 5. Note the prominent gray–white matter differentiation even on the improperly windowed DW image in B. C, Properly windowed DW image in a neurologically normal 40-year-old man for comparison shows that the gray–white matter differentiation is usually not so accentuated on DW images in a neurologically normal patient. Figure 3 (patient 6) reflects the findings at MR imaging (performed with the 3T MR system) in a patient presenting after cardiac arrest; the initial CT scan (obtained < 4 hours after arrest) was interpreted as normal. Figures 3A and 3B illustrate the mild gyral swelling and mildly pronounced gray–white matter differentiation of the cerebral hemispheres on T2-weighted and turboFLAIR images, respectively, and Fig 3C is an improperly windowed (window/level 1150/650) DW image. The cortical restricted diffusion is more apparent on Figs 3D (properly windowed DW image at window level of 250/150) and 3E (ADC map). Patient 6. A 40-year-old comatose man underwent MR imaging (performed with the 3.0-T magnet) approximately 3 days after cardiac arrest to aid in determining neurologic prognosis. CT scan (not shown) obtained within 4 hours after the arrest and anoxic insult was interpreted as normal. A, T2-weighted image (windowed at 700/500) illustrates mildly pronounced gray–white matter differentiation of the cerebral hemispheres and gyral swelling. B, TurboFLAIR image (windowed at 650/400) demonstrates similar findings as those on the T2-weighted image, with mildly pronounced gray–white matter differentiation. C, Improper window/level (1150/650) obscures the diffuse cortical abnormality on this DW image. Although improperly windowed, there is accentuated gray–white matter differentiation, not usually present on DW images (as in Figs 1 and 2). D, DW image with proper window/level of 250/150 shows that the cortical abnormality is more evident. The caudate nucleus (although slightly hyperintense) did not demonstrate as severely restricted diffusion as that in patient 1. E, ADC map further illustrates the symmetric and uniform cortical restricted diffusion, with less prominent diffusion abnormality in the deep gray nuclei. In each of the six cases, markedly pronounced cerebral gray–white matter differentiation was seen on the DW images. Severely restricted diffusion was demonstrated throughout the cerebral cortex in the five patients in whom ADC was measured (mean ADC, 0.35 × 10−3 mm2/s), compared with the reported normal ADC value (0.78–1.09 × 10−3 mm2/s) in cortical gray matter (5). In these five studies (Table 2), the deep gray nuclei demonstrated variable mildly restricted diffusion (mean ADC, 0.76 × 10−3 mm2/s in the caudate nucleus) that was not as severe as in the cerebral cortical gray matter. Abnormal hyperintensity on DW images was also noted in the cerebellar gray matter in patients 1–3 but not in patients 4–6. ADC values were also measured in the white matter of the centrum semiovale in five of the six patients (mean ADC, 0.91 × 10−3 mm2/s) and were actually upper limits of normal or slightly elevated compared with the reported normal white matter values of 0.62–0.79 × 10−3 mm2/s (5). No significant abnormal contrast enhancement was noted in any of the four patients in whom gadolinium-enhanced T1-weighted images were obtained. In four of the patients (patients 1–3 and patient 6), the outcome was brain death and withdrawing of medical support (Table 1). Two patients (patients 4 and 5) were deeply comatose at presentation for MR imaging, and the eventual outcome was permanent vegetative state. HIE results from a global rather than a focal ischemic insult to the cerebrum and implies either a profound loss of cerebral blood supply or hypoxia despite adequate perfusion. Most commonly, this is due to cardiac or respiratory arrest (6). Rarely, the patient may recover from such an insult, but more often it results in devastating and severe neurologic deficits, including severe memory loss, personality changes, permanent vegetative state, or death. Other causes include hypoxia resulting from pulmonary disease, anemic HIE (classically resulting from carbon monoxide poisoning), hypoglycemia, overdose, toxins, strangulation, near drowning, status epilepticus, or electrocution (1). The clinical diagnosis of HIE is primarily made by history and physical examination, although electroencephalographic activity and somatosensory evoked potentials can be used as supporting evidence. Neuroimaging has been used, including CT, single photon emission CT, positron emission tomography, and MR imaging (1). More recently, DW imaging has proved to be an accurate and a relatively quick method for early diagnosis of both focal and global cerebral infarction, with the hyperintensity on DW images resulting from cytotoxic edema and restricted diffusion of free water. In experimental animal studies, DW imaging has been well studied to detect infarction within 1 hour of occlusion (7). Areas of hyperintensity on DW images have been repeatedly shown to correlate anatomically with areas of infarction at histologic examination (6, 8, 9). Microvacuolation (as seen on light microscopy) is one of the earliest histologic findings of infarction (10) that can be seen within 1 hour after HIE due to cardiac arrest (11), and it can progress to necrosis or apoptosis on histologic examination (9). Within 3 days after global anoxic insult, the regions of microvacuolation have been demonstrated to correlate with the appearance of restricted diffusion in the hippocampi of rats in which global cerebral ischemia was simulated by four-vessel occlusion (9). In humans, therefore, the early ischemic changes in the cortex may represent microvacuolation in the early subacute phase in survivors of cardiac arrest after cardiopulmonary resuscitation (9). HIE often results in diffuse cortical injury. One particular pattern of ischemic injury to neurons in the cortex is known as “cortical laminar necrosis,” named because a band of necrosis is seen in the cortex on histologic examination (3, 12–15). Within the cortex, the third layer is the most vulnerable, followed by the fifth or sixth, with the second and fourth being relatively more resistant to ischemic necrosis from hypoperfusion (11). ADC values in white matter decrease at a much slower rate than those in cortical gray matter since the white matter is intrinsically more resistant to ischemia than is gray matter (16). Hence, it may be possible to detect with DW imaging this type of diffuse injury in the acute or early subacute stage. The appearance on DW images of abnormal hyperintensity in gray matter relative to white matter in the acute or earlier portion of the subacute phase after HIE has also been described in several other studies (9, 17, 18). For example, patients who have experienced global cerebral ischemia as a result of cardiac arrest may demonstrate abnormal cerebellar, cortical, and basal ganglia hyperintensity on DW images in the acute phase (< 24 hours) and in the earlier portion of the subacute phase, whereas there may not be white matter abnormalities on DW images until later in the subacute phase (14–20 days) (3). Similar cortical abnormalities and outcomes were described in a study of patients soon after cardiac resuscitation who were comatose at presentation (17). In that study, nearly all of the patients who were imaged 1–15 days after anoxic insult and demonstrated multiple foci of diffusion abnormalities in the cortex or basal ganglia eventually progressed to either a permanent vegetative state or brain death. Kawahara et al (9) also described three patients after cardiac resuscitation who had diffuse patchy cortical hyperintensity on DW images that were obtained 3 days after the insult; each of these patients progressed to a permanent vegetative state. Previous reports of MR imaging in patients with anoxic or hypoxic encephalopathy describe the appearance of a laminar hyperintensity in the cortex on T2-weighted and FLAIR images (variably seen as early as 1 day after injury) and T1-weighted images (in the late subacute phase, usually at least 14 days after injury) that is thought to represent cortical laminar necrosis (12, 13, 18–20). However, an interesting imaging appearance analogous to that in the six cases presented herein has been described at spin-echo MR imaging in global cerebral ischemia in a report of five patients with clinically proved brain death (21); it is termed a “supernormal” appearance. On both proton density- and T2-weighted images, the gray–white matter differentiation of the cerebral hemispheres was preserved, although the T2 signal intensity in both the gray and white matter was increased and there was effacement of the subarachnoid spaces presumably due to cortical edema. DW imaging findings and ADC values were not described in that study, but the imaging features on the routine spin-echo T2-weighted image appear to correspond to those seen on the T2-weighted and turboFLAIR images in the cases of the current study. Theoretically, the differential appearance of the gray and white matter on DW images in the cases presented herein may be related to infarction of cortical gray matter out of proportion to that of the white matter. However, if the patient is imaged in the early subacute phase, the spin-echo T2-weighted images may reveal only subtle abnormality (3, 9), and DW imaging and ADC mapping may be of greater diagnostic utility. In experimental animal studies, ADC was reported to begin to decline 2–4 minutes after induced cardiac arrest (22). It has also been suggested that if successful cardiac resuscitation is performed within 15 minutes after the induction of global cerebral ischemia (in animal models), normalization of the ADC within 30 minutes after cardiac arrest may be a reliable indicator of cerebral recovery after resuscitation (23). Hence, there may be a reversible component of ADC values in the setting of cortical laminar necrosis and HIE in the hyperacute phase; however, patients are rarely imaged this early. Pathologic correlation of the six cases in this study was not available since all six families refused autopsies. However, the studies cited above have shown that diffuse cortical hyperintensity on MR images correlates with cortical laminar necrosis (1, 13, 19, 20), and this appearance typically results in either permanent vegetative state or brain death when diffuse (9, 17). Therefore, we surmised that the six patients in this study progressed in a similar clinical fashion and would further corroborate the neuroradiologists’ interpretations of the cases presented in this study. In these six patients, the appearance demonstrated on DW images is analogous to the “superscan” in the nuclear medicine literature that describes an appearance of diffuse skeletal metastases on a radionuclide bone scan where the skeletal signal is prominent when compared with the soft tissue and kidney uptake (24). Conceptually, this imaging appearance is similar to the cases presented in this study, in which global cerebral ischemia causes diffuse injury to the cerebral cortex, and the cortical gray–white matter differentiation is accentuated on the T2-weighted and FLAIR images (in the early subacute phase), but is much more visually apparent on properly windowed DW images. Hence, the brain can appear deceptively normal to the unaware observer on improperly windowed DW images (due to the uniform and symmetric cortical hyperintensity); although even in the scenario of improper windowing, the observer should note that the gray–white matter differentiation is abnormally accentuated. Arbelaez et al (3) previously speculated that this potential imaging pitfall could occur in the transition between the late acute and subacute stages. 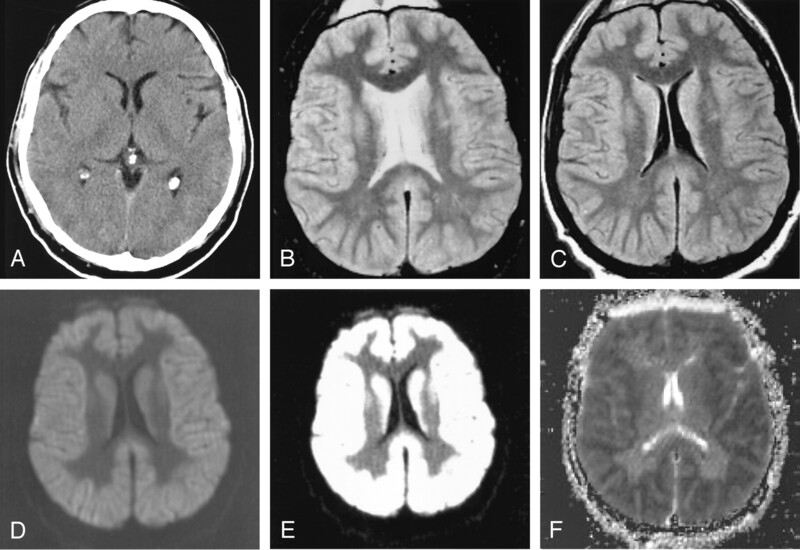 In particular, in the early subacute phase after the anoxic event (likely around 24–72 hours, based on the current study), there may be a paucity of findings on CT scans or even on other MR images, and the DW imaging appearance described herein may be predictive of diffuse cortical laminar necrosis in the setting of HIE and, hence, predictive of the clinical outcome of either permanent vegetative state or brain death. The patients reported on in this study were not imaged later than 5 days after the anoxic insult, after which “pseudonormalization” of the ADC values may occur (17), and high signal intensity may not be seen within the cortex on DW images. DW imaging can be useful in demonstrating the early signs of HIE and cortical laminar necrosis. In the cases of HIE illustrated here, there is a potential windowing pitfall, with an MR imaging appearance that carries an extremely poor prognosis (either permanent vegetative state or brain death). Presented at the 41st annual meeting of the American Society of Neuroradiology, Washington, DC, April 27–May 2, 2003. Accepted after revision March 22, 2004.